Part of the exposed works at Ministry of Culture of Peru during the second exposition of paleoart and paleoreconstruction ´´Marine Ecosystems of the Past´´. Two Acrophyseter robustus chase a school of fish in what one day would be the peruvian coast. 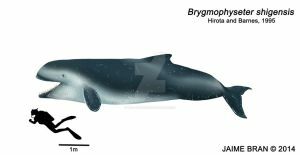 Acrophyseter robustus was one of several predatory sperm whales prowling the oceans during the middle Miocene, which could reach lenghts of over 4m. its teeth and cranial configuration suggests it could deliver a powerful bite. l cant stop doing these physeteroids, l cant recall how many times l have sketched these...was done in Zbrush, Keyshot+Photoshop for the edition. This is really cool, it looks so real! Did you use a photo or something for the background? If so, I commend you even more on making the Acrophysters look like they really 'belong' in the scene. A tough thing to do when a photo sets the lighting conditions for you to work with. Thanks a lot , yes, actually l used a photography for the background, the same for the fish, originally it was going to have more than two Acrophyseter, pursuing a small whale but l had little time left, so l went into a more ‘’peaceful’’ setting for these whales. Certainly looking for a right picture for the scenes can be very difficult and adapt the image to it as well (There is a black and White version of this one which l think the lights turned out slightly better). Interesting...what happened to the beaked jaws? Mmm well here i tried to round up a little bit the melon transition to the jaws. My favorite whales, this looks awesome! Thank you, yes, these are my fave physeteroids, one just can´t stop taking them as topics . I can't imagine how fascinating they would be in life.